Is Israel A Modern State? Zionism is primarily a Christian Protestant enterprise that has little to do with Judaism. This explains why US Christians are the most ardent Zionists and the most powerful supporters of Israel. The largest opposition to Zionism came initially from the rabbinical elite, which viewed it as heretical and an aberration of the Jewish faith. Zionism represents a break with Jewish tradition and historical continuity. Israel has to be seen in terms of European nationalism, colonial expansion, and geopolitical interests rather than as the divine fulfillment of biblical prophecies or even a culmination of Jewish history. The traditional Judaic yearning for “Return”, which is a purely spiritual concept, was turned into a political cause by Christians in order to accelerate the coming of Christ and force the Jews to convert to Christianity. The influence of Christian Zionists plays a very important role up to the present day. These are only some of the most provocative conclusions of Yakov M. Rabkin’s fine analysis of modern day Israel. What was true of the 18th and 19th centuries, also held true for the 20th century. Many leading British politicians such as Lord Balfour were anti-Semitic. So there was a fertile ground for anti-Semitism in Britain among Protestants. Therefore, it should not surprise anyone, that the zeal of Protestant Christianity to settle the Jews of Britain in the so-called Holy Land, had little to do with Christians affection for Judaism, but rather with their anti-Semitism and self-interest. Yakov M. Rabkin is Professor of Contemporary History at the University of Montreal. He has been a visiting scholar at many universities around the world. He has written extensively on subjects such as science, technology, and ideology. His most acclaimed book, however, is “A Threat from Within: a Century of Jewish Opposition to Zionism”, which has been nominated for Canada’s Governor-General Award, Israel’s Hecht Prize for Studies in Zionism and listed as one of the three best books of the year in Japan. This book has been translated into twelve languages. To understand modern-day Israel, one should put Judaism and Jewish tradition aside because such a connection is misleading; for “Zionism and the state that incarnates it are revolutionary phenomena”. Such provocative theses are very numerous scattered all over Rabkin’s book. It’s easier to understand the policies and the structure of the State of Israel by leaving aside references to Jewish history. As a consequence, Rabkin suggests that one should speak of the State of Israel as a “Zionist state” rather than a “Jewish state”. The same holds true for the Israel lobby that should be designated as a “Zionist lobby” rather than a “Jewish lobby”. Instead of delving into the religious mythology of Jewish history, Rabkin urged readers to analyze Israel within the context of international politics, Western interests and the resources of the Middle East. “The Jews came to Zionism long after the Christians”, states the author. Even Zionist leader Theodor Herzl was influenced by Christian protestant thinking. (He first wanted to “solve the Jewish question” (Judenfrage) by having all Jews convert to Catholicism.) The idea to gather all Jews in one location did not originate with Jews but in English and American Protestant circles. It was considered of “supreme importance to Christianity” writes Rabkin. Herzl got initially familiar with this idea through a Protestant clergyman from the British embassy in Vienna. Till today Protestant support for Zionism continues to play a crucial role, which can be seen in the U. S. and other countries. According to a Pew poll, 82 percent of WASPs (=White Anglo-Saxon Protestants) believe that God gave the State of Israel to the Jewish people, while only 40 percent of Jews share this belief, as Rabkin says. For several decades, the Zionist national movement was associated in Western public opinion with leftist socialist ideas. For socialist internationalists, it was not natural to support a movement promoting ethnic nationalism. Zionist ideas firmly rooted in Europe were popularized by a “mere handful of assimilated Jews in Central Europe”, said Rabkin. Consequently, many socialist Jews rejected Zionism as a reactionary movement, while religious Jews rejected the Zionist agenda of the return to the “Land of Israel” by “political means” as incompatible with “the idea of salvation in Jewish tradition”, writes Rabin. The most active Zionists to settle in Palestine were Russians, who strove to build a new socialist society ignoring the natives who had lived there for generations. They called their policy hafrada, “separation”. That’s why it’s no coincidence that the Netanyahu government gets along so well with Russian President Vladimir Putin, in particular, Moldova-born Foreign Minister Avigdor Lieberman.. According to Rabkin, for the majority of Zionists, “the Nazi genocide stands as the ultimate proof of the dangers that threaten Jews around the world”. Zionism is often portrayed as a movement to make anti-Semitism obsolete by creating a State for the Jews. Herzl was convinced that the anti-Semites would be the Zionists’ “friends and allies” since they wanted to rid their countries of Jews. According to Rabkin, the emphasis on anti-Semitism (and, when needed, promotion of it) has been the most reliable means to prod Jews to emigrate to Israel. Israeli leaders regularly tell world Jewry that Israel is the only safe place for the Jews. To speak about contemporary Jewish history, one has to deal with the Nazi genocide, writes Rabkin. The Nazi genocide is a constitutive part of Israeli Zionist identity. Zionists and religious orthodox Jews have drawn very different conclusions from this horrific crime against humanity. “This tragedy has been transformed into a vector for national unity in Israel, and for Zionist allegiance in the Diaspora.” This transformation has given rise to serious critique among Israeli intellectuals. Although Zionists and their detractors agree on the hostility encountered by the Jews over the centuries, they differ on the reasons. Zionists generally explain “this hostility by the political and military weakness of the Jews, while pious Jews tend to see it as a punishment for the sins committed by the Jews themselves”, argues Rabkin. Although only half of the world’s Jewish population lives in Israel, the Israeli political establishment pretends to speak on behalf of and represent, all the world’s Jews. They claim that their Zionist state belongs to all Jews, while the native Palestinians are at best tolerated. Rabkin rejects the criticism of the liberal Zionists that the current government has betrayed original Zionist intentions. Instead, he stresses the continuity of the Zionist state from its inception till this day. In spite of the legitimate criticism of Israel and its negative image among the population in Western countries, their “elites lend it increasingly unconditional support”. Examples of this uncritical support abound. Rabkin cites the unanimous acceptance of Israel into the OECD, shortly after the Israeli Defense Forces (IDF) killed 1 400 people in the Gaza Strip in the winter of 2008/2009. Israel’s modernity is fragmented and uneven. Although the State of Israel is a high-tech society with a powerful military that wields atomic weapons, hundreds of thousands of its ultra-orthodox citizens lack modern elementary education and languish in poverty. The legitimacy of Israel is still questioned in the region. On the one hand, some segments of orthodox Jewry still do not recognize the Zionist State because they reject the nationalistic reconceptualization of the Jews; on the other hand, Palestinians – the victims of Zionist colonization – refuse to recognize Israel as a “Jewish” State as demanded by the Zionist ruling class. Even the question “who is Jewish” is still contentious within Israel. Is Israel a Jewish or a Zionist state? The author has opted for the latter because the gap between Zionism and Jewish history continues to exist and could not be bridged until today. Yakov Rabkin’s book demonstrates that Zionism is not the culmination of Judaism. Nor is the mantra of “Jewish and democratic state” is very persuasive. The book’s provoking views are grounded is convincing and boldly arguments. After “A Threat from Within: a Century of Jewish Opposition to Zionism”, this is another must read from the pen of a true scholar. 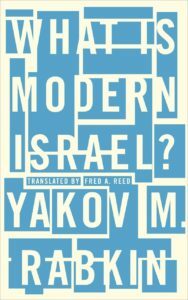 Yakov M. Rabkin, What is Modern Israel, Pluto Press, London 2016, 228 pp. $ 27. Amazingly uninformed author and reviewer. To get it straight, I suggest that they go live in Israel for a few years. Then rewrite the book and the review. Pathetic, really. Uninformed? no. 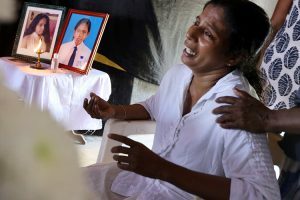 Without dogmatic propaganda? yes.